In the coming months, RealKM Magazine is bringing you a new series to parallel our popular exploring the science of complexity series. This new series is featuring case studies in complexity from my previous work, and also invited contributions from other authors. This year marks the 20th anniversary of the Cynefin framework (Figure 1), a now very well-known and highly-regarded decision and analytical framework created by Dave Snowden. As well as having become an institution in knowledge management, Cynefin has been widely applied, for example in project management and IT design. Figure 1. 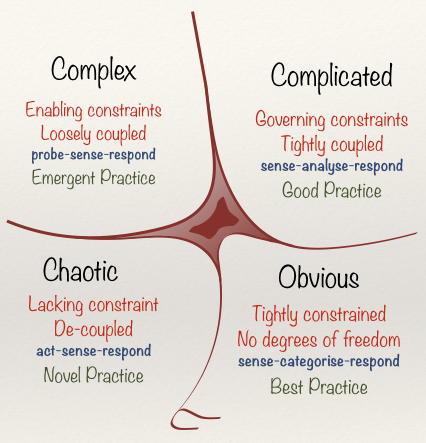 Cynefin framework (source: Dave Snowden on Wikimedia Commons, CC BY-SA 3.0). Open up the discussion. Complex contexts require more interactive communication than any of the other domains. Set barriers. Barriers limit or delineate behavior. Once the barriers are set, the system can self-regulate within those boundaries. Stimulate attractors. Attractors are phenomena that arise when small stimuli and probes (whether from leaders or others) resonate with people. Encourage dissent and diversity. Dissent and formal debate are valuable communication assets in complex contexts because they encourage the emergence of well-forged patterns and ideas. Manage starting conditions and monitor for emergence. Because outcomes are unpredictable in a complex context, leaders need to focus on creating an environment from which good things can emerge, rather than trying to bring about predetermined results and possibly missing opportunities that arise unexpectedly. However, despite this guidance, leaders and managers continue to make decisions that are inappropriate to the decision-making context. In particular, decision-making that is appropriate to obvious and complicated contexts is being applied in complex contexts, and the consequences of this can be devastating. I’ve been deeply distressed by a number of headline-making examples of this over the past few months. Two weeks ago, on 15 March 2019, the world was shocked and saddened when a man from the regional Australian city of Grafton massacred 50 Muslim worshippers in an act of right-wing extremist terrorism on two mosques in the New Zealand city of Christchurch. While I was deeply shocked by the massacre, I wasn’t at all surprised by it. Right-wing extremism has a long history in Australia. I’ve directly and personally experienced the rise of this right-wing extremism over the past 25 years, and have sought to sound the alarm about it and its causes. As I alerted in a RealKM Magazine article last year, many Australians, particularly those in rural and regional areas, have been left out of the decision-making processes for the complex issues that affect their lives and futures. These decision-making processes are linear and conducted with minimal communication and engagement (that is, knowledge flows), in direct ignorance or rejection of the ‘open up the discussion’, ‘stimulate attractors’, ‘encourage dissent and diversity’, and ‘manage starting conditions and monitor for emergence’ tools that Snowden and Boone recommend leaders use for managing in complex contexts. This has led to a large and growing number of people feeling marginalised, and the absence of communication (knowledge flows) has meant that these marginalised people have made up their own distorted reality in the absence of the facts and evidence. This distorted reality has included incorrect and inappropriate perceptions in regard to immigration and the Muslim faith. Further, rather than following Snowden and Boone’s advice to ‘set barriers’ to delineate these incorrect and inappropriate perceptions from appropriate behaviours, Australia’s political leaders have actually sought to capitalise on these perceptions for their own political ends. This includes the current Australian Prime Minister, who saw votes in anti-Muslim strategy. This has helped to legitimize the incorrect and inappropriate perceptions. A second example occurred in January this year, when Australian televisions screens were filled with images of dead 100-year old fish being pulled from the Darling River, including the critically-endangered Murray cod. The Darling River is part of the Murray-Darling Basin, which spans four Australian states and the Australian Capital Territory and is home to half of Australia’s irrigated agriculture. This makes it highly significant to the Australian economy. However, fluctuating water availability, increased agricultural production, ecological decline, and a century of poor cooperation between the six governments responsible for the Basin has created an environmental management crisis. As with the New Zealand massacre, while I was angered by the fish kills and Royal Commission findings, I wasn’t at all surprised by them. As I alerted in another RealKM Magazine article last year, the development of the Murray-Darling Basin Plan is yet another example of where decision-making that is appropriate to obvious and complicated contexts has been applied in a complex context, with devastating consequences. As I discuss in the article, the ‘open up the discussion’, ‘stimulate attractors’, ‘encourage dissent and diversity’, and ‘manage starting conditions and monitor for emergence’ tools recommended by Snowden and Boone have been ignored or rejected by the MDBA. The ‘set barriers’ tool was also not used. In this case, it should have been applied to set boundaries in regard to inappropriate actions that could cause potentially irreversible decline in river ecosystems. However, the Murray-Darling Basin has now plunged into social and ecological chaos, with ecosystems in a state of serious collapse and Basin stakeholders alienated and disenfranchised to the point where trust will be extremely difficult to restore. A third example occurred last year, when former celebrity academic Brian Wansink was found guilty of academic misconduct. Wansink’s research had linked eating habits to food environments, concluding that simple changes in those environments is a solution to chronic health issues including obesity and diabetes. An example of a food environment change is to serve meals on smaller plates. However, the influences acting on chronic health issues such as obesity are highly complex, so as I contend in a RealKM Magazine article series, the only way that Wansink could get his simple food environment changes to appear to be an effective solution was through p-hacking and the other inappropriate practices that were identified in the misconduct finding. These and other examples that I could describe suggest that there’s a need for much more guidance for leaders in regard to understanding and managing complexity. But therein lies a very significant and serious problem. In seeking to provide further guidance, there’s the risk of doing the very thing that we’re trying to prevent through providing the additional guidance. 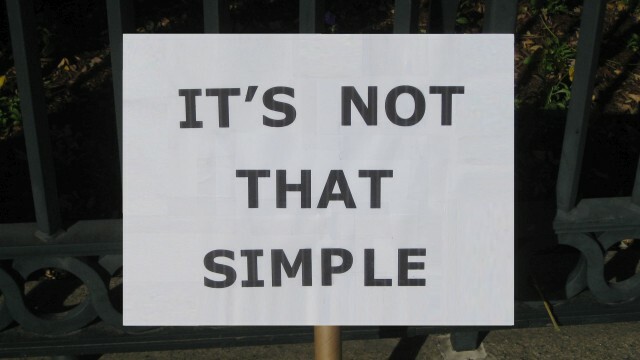 That is, simplifying or breaking down the decision-making approaches recommended for complex contexts so that they become appropriate only to obvious and complicated contexts rather than complex contexts. We’ve located a resource that assists a greater understanding of complexity, which we’re bringing to you as the exploring the science of complexity series. This resource is a rarity in that it doesn’t seek to simplify complexity, but rather to explain it in terms of a series of concepts with associated commentary in regard to what that means for managing complexity. However, I agree with Dave Snowden’s assertions that it’s impossible to provide more detailed guidance in regard to managing complexity without making it inappropriate to complex contexts. So it shouldn’t be attempted. As can be seen in the examples I’ve discussed, using decision-making that is appropriate only to obvious and complicated contexts in a complex context results in devastating consequences such as the loss of life and the collapse of vital ecosystems. So we all need to stop doing it. Instead, what this new series is doing is putting forward case studies that are analysed in the context of the advice given by Snowden and Boone in “A leader’s framework for decision making”, in particular their recommended tools for managing in a complex context. Most of my work over the past 37 years has involved working with complexity. I didn’t become aware of the Cynefin framework until 2006 when I first engaged in a formal way with knowledge management, but as I studied the framework I found that it accorded completely with what I’d been doing to manage in complex contexts. This isn’t at all surprising, because I’d learnt through my own experiences that there’s no other way to successfully manage in complex contexts. The introduction of the TTR was based upon a perception that continuing increases in aircraft complexity were exposing shortcomings in the training system’s ability to provide personnel with adequate fault diagnosis skills. Exacerbating this situation was the increased level of avionics integration of the newer aircraft, which blurred the lines of demarcation between the aviation trades as they were defined at the time. whilst the resultant injection of diagnostics capability was the result desired, the lack of understanding of how best to employ and integrate these new tradesmen, and an impression that they should have some kind of special status, engendered resentment and uncertainty amongst their peers. There was a belief amongst tradesmen (including many of the TECHAPPs themselves) that these new ‘super techs’ would be fast-tracked to become SYSTECHs, gaining an unfair advantage and threatening the promotion prospects of their peers. The TECHAPP scheme had been proposed and championed by a senior RAAF officer who hadn’t realised that an apparently simple change in a complex social context can bring unexpected consequences. As Snowden and Boone advise in A Leader’s Framework for Decision Making, “in a complex system … we cannot forecast or predict what will happen.” The Australian Defence Force (ADF) would later stop training technicians to the depth and breadth of TECHAPPs, and instead shift the emphasis to on-the-job competency development. However, this approach also brought its own array of complex problems. Following on from this grounding in technical and social complexity, I left the RAAF to pursue an emerging and growing interest in environmental and heritage conservation. These are highly contested issues, with a diverse array of stakeholders having a wide range of different and often conflicting perspectives in regard to what should be done and how it should be done. The way in which each stakeholder approaches the issue will be influenced by their wider frame of interactions. This creates a socially complex context for decision-making, and in the case of environmental conservation, this social complexity interfaces with the ecological complexity of natural ecosystems which compounds the overall complexity. Almost immediately after leaving the RAAF I was able to experience and contrast both appropriate and inappropriate approaches to managing complexity. On the one hand, I became a member of Ipswich City Council’s Heritage Advisory Committee, where for the three years from 1991 to 1994 I collaborated with the other members of this diverse multi-stakeholder group to use Snowden and Boone’s tools in the development of measures to securely protect Ipswich’s rich heritage. At the time, this was one of the most ambitious heritage programs undertaken anywhere in Australia, but because of the approach we used, it gained 101% acceptance from heritage property owners and the community. I say 101% because not only did we gain acceptance of the heritage conservation provisions from absolutely every property owner, but there were a number of owners whose properties hadn’t been identified in the comprehensive survey that wanted them to be included! On the other hand, I also joined the conservation movement where I learnt that Aboriginal people were being excluded from decision-making in regard to culturally significant landscapes, and that there was a significant disconnect between community aspirations in regard to environmental conservation and the actions of all local government. In response, I worked with Ipswich City Council and the adjacent Moreton Shire Council to bring about the the establishment of multi-stakeholder local government Aboriginal and environmental advisory committees. These committees provided a forum for the ‘open up the discussion’, ‘set barriers’ , ‘stimulate attractors’, ‘encourage dissent and diversity’, and ‘manage starting conditions and monitor for emergence’ tools recommended by Snowden and Boone. Through my involvement in the conservation movement in the early 1990s I would also learn that there can be hidden layers to complexity that we can be unaware of or that our cognitive biases hide from us — that is, unknown unknowns. As I discuss in another RealKM Magazine article, a stark example of this was discovering that a prominent and well-supported environment organisation called Mothers Opposing Pollution was actually a complete fake — one of many fake front groups established by industry to deceive the public. In the mid-1990s I started to work for the World Wide Fund for Nature (WWF) and Queensland Government Department of Environment on rural nature conservation, and also joined a rural landcare and catchment management group. My previous experiences with complexity in the RAAF and in heritage and environmental conservation meant that I was automatically recognising and considering the complexity of the situations I was encountering. I was immediately able to identify that nature conservation on private land couldn’t be successfully achieved by imposing simplistic rules on landholders because the ability of the landholder to engage in conservation was influenced by a complex array of factors. I went on to successfully apply the ‘open up the discussion’, ‘set barriers’ , ‘stimulate attractors’, ‘encourage dissent and diversity’, and ‘manage starting conditions and monitor for emergence’ tools recommended by Snowden and Boone in a number of programs and projects. This included the landmark Sustainable Management of the Helidon Hills Project (Figure 2) and award-winning Holistic Natural Resource Management of Crows Nest Shire Project. Figure 2. 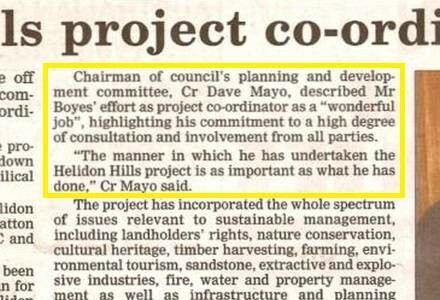 Excerpt from media article at conclusion of Sustainable Management of the Helidon Hills Project (source: Helidon Hills project coordinator ‘unties cord’). Through this work I found that while many government bureaucracies were supportive, some presented a significant challenge to the use Snowden and Boone’s tools. These unsupportive bureaucracies wanted neat tangible ‘outcomes’ that could be put into boxes and checked off, whereas the ‘outcomes’ I was achieving were ongoing multi-stakeholder social processes that were continuing to convene discussions, stimulate attractors, and monitor for emergence. In 2003 I moved interstate, where I continued to apply the tools recommended by Snowden and Boone in a range of programs and projects. This included my overall program management of the award-winning $77.4 million Hawkesbury-Nepean River Recovery Program. Like the Murray-Darling River system discussed above, the Hawkesbury-Nepean River system is an iconic and highly complex river system in Australia, but as I discuss in a previous RealKM Magazine article, the outcomes have been very different to the ecological and social disaster that is now the Murray-Darling Basin. Seven years ago I moved from Australia to China, where the complex context now includes cultural differences. So far I’ve learnt a lot, but there’s still much to know. Insights that I’ve shared in RealKM Magazine to date include how cultural misconceptions distort knowledge, how village level decision-making is persisting in complex urbanised environments, that there are cultural biases in knowledge management, and that there is a serious imbalance in global knowledge production and knowledge management research. In this new case study series, I’m describing each and every one of my experiences with managing in complex contexts. I’ll also be publishing case studies from other authors — if you would like to put forward a contribution for consideration please feel free to contact me. The case studies all follow a common summary-style format to facilitate easy reference and navigation. Header image source: www.futureatlas.com on Flickr, CC BY 2.0. Note that in 2014, Dave Snowden changed the name of the ‘simple’ context, as discussed in “A leader’s framework for decision making”, to ‘obvious’ as shown in Figure 1. The tools are summarised here. For additional detail refer to A Leader’s Framework for Decision Making. Xinos, J. (2003). What Makes Techo’s Tick? The Human Factor in ADF Aviation Maintenance Capability. Chief of Air Force Aerospace Fellowship 2001, Royal Australian Air Force (RAAF) Aerospace Centre. p. 34. Xinos, J. (2003). p. 35. Xinos, J. (2003). p. 43. It’s about people: helping people to learn, know, participate, act and interact has been the focus of my diverse career.